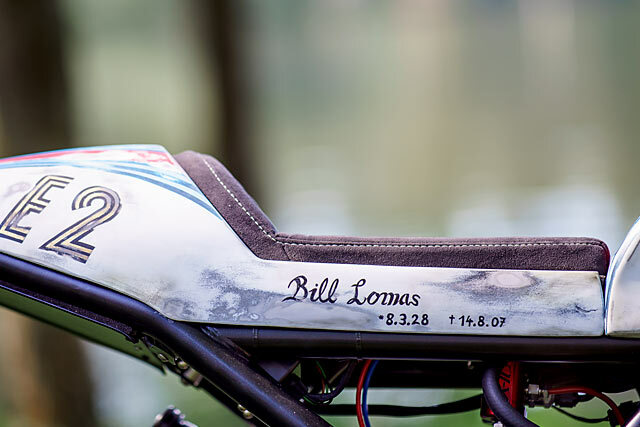 When it comes to old-school motorcycle racers, they don’t come much cooler than England’s Bill Lomas. Grand Prix motorcycle road racer. Two-time World Champion. Two-time Isle of Man TT winner. 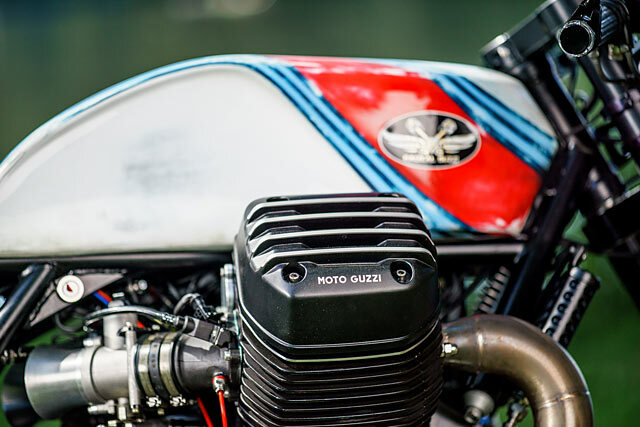 Moto Guzzi V8 rider. And to gild the lily, he was a bit of a movie star to boot. Starring in the 1957 film, ‘I Fidanzati Della Morte’ or ‘Friends of Death’, he’s not half bad. 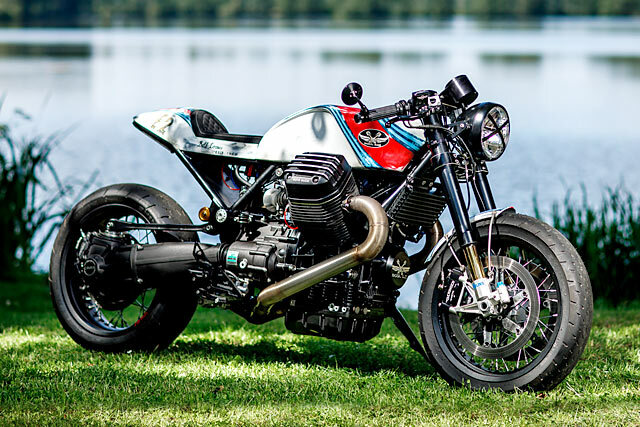 Germany’s Radical Guzzi decided they wanted to honour him by building a bike in his name, and this nitrous beast named ’Fidanzata’ is what they came up with. Traveling the length and breadth of Europe in 2017 with the Sultans of Sprint circus, Stefan and rider Josef from the Schwarzenfeld shop in Eastern Germany spent most of their time thrashing their NOSferatu racer up and down the strip. “We did all the races this year from Monza to Mothlery in France, Spa in Belgium and now the final race at Glemseck 101 in September”. But they had another bike in mind for Essenza in 2017. One that was even bigger and badder than their show-winning 2016 entry. “The bike was nothing more than a crazy idea in my head,” says Stefan. “Then I was talking with our designer Kai Rieman and alloy meister Hans Eickeler. After many designs, we started the build. Basically, the bike didn’t exist before we made it from scratch”. The timeframe for this something-to-nothing miracle? A mere five weeks. The bike is based on a heavily modified Bellagio frame. The motor is from a Griso and was fitted with forged pistons and so many new and modified internal parts, it’s probably more new than not. There’s an Öhlins TTX in the rear which is perfectly matched to the Öhlins fork up front. Stoppers are courtesy of Behringer and the spoked rims run two Shinko drag tires. 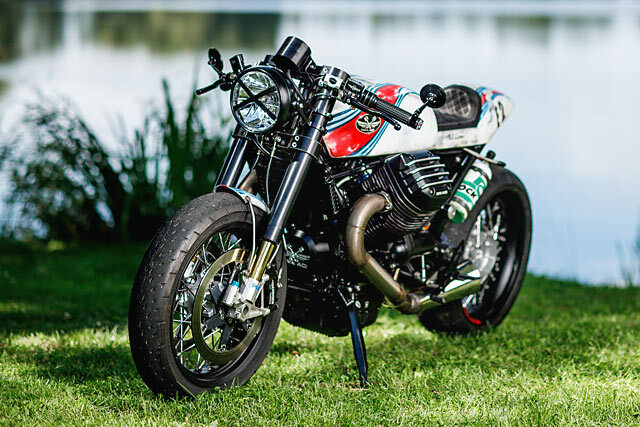 “My inspiration was to build a kind of modern cafe racer. I realised that the Bellagio frame was similar to the old Tonti frames, but with the ability to mount a new gearbox and swingarm. The design and paintwork was inspired by old Martini race cars, but I wanted to have it worn and with a patina rather than a new finish”. 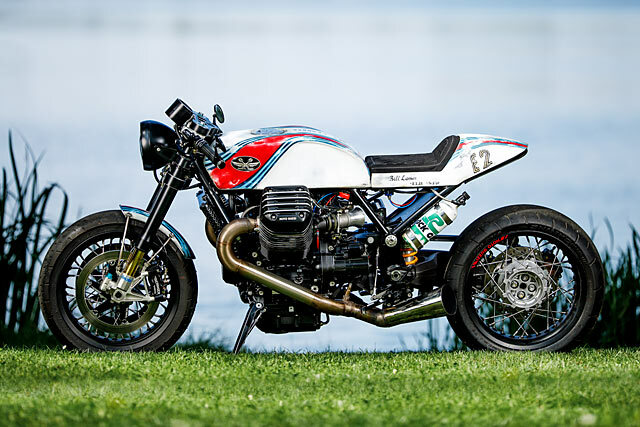 One of three sister bikes, the frames were ordered from the Guzzi factory before being built into a rolling chassis so that the bodywork could be formed around one bike while the rest of the build was taking place on another ‘dummy’ bike. Henry Ford, eat your heart out. Sister No.1 managed to win Essenza’s 2016 design contest, took third place in the Glemseck Sprint and a second at Cologne’s Intermot. And all this without a turbo, supercharger or NOS. “Our rider, Josef ’Lightning Sepp’ Leitl was the overall winner of the rider’s comp. It was also the winner of the Essenza Championship 2016. A big success, we think”. 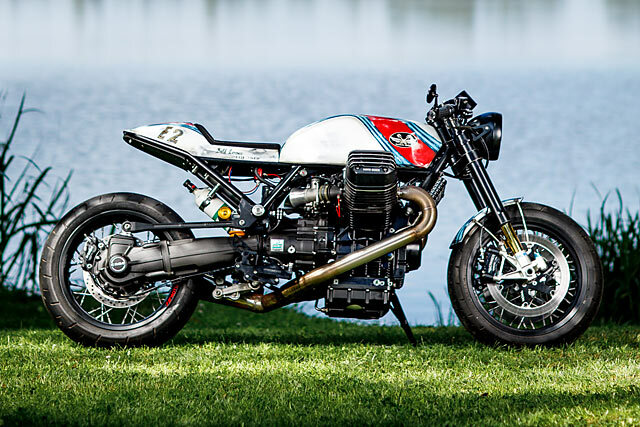 In 2017 and without the support of the Guzzi Factory, they gave themselves only five weeks for the build. 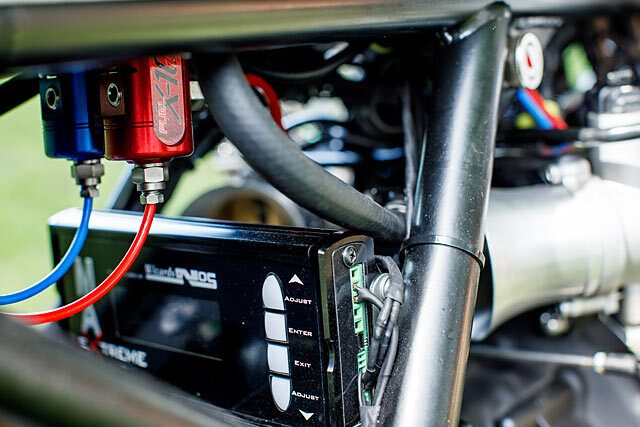 As always, the bike was started for the first time on the night before its inaugural race and with a NOS system that was completely untested. “We drove overnight to Monthléry in France. Of course, you can imagine what happened… not much at all. But it was a great preparation for Glemseck”. 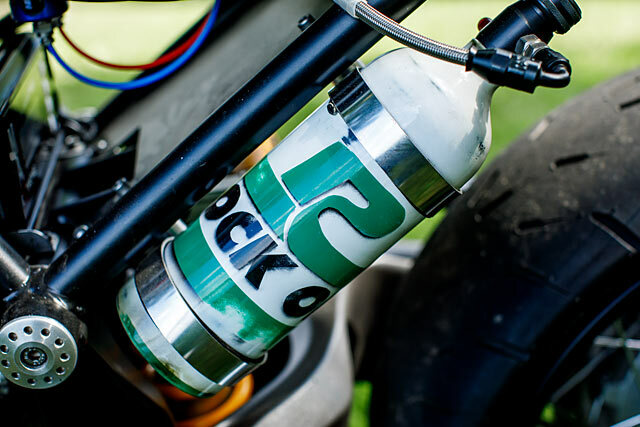 “We decided to try a programmable NOS injection system on this bike; our first time ever. After a pretty steep learning curve, we found that it works really well”. 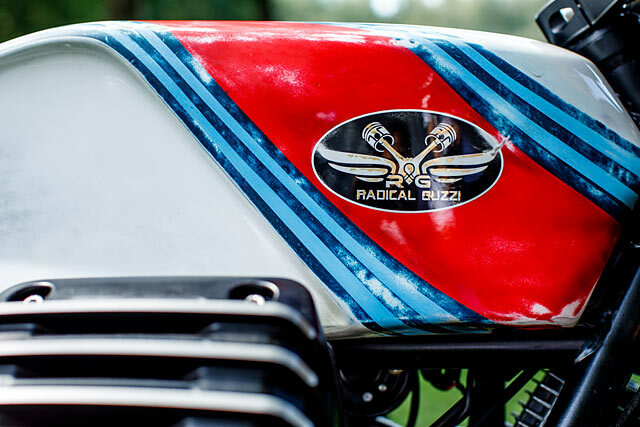 Other things that work well include the sound of the thing; with the megaphone exhaust and the open intakes, we think it’d definitely give that ‘56 V8 Guzzi a run for its money. Especially on full throttle. As a testament to the passion that’s gone into the bike, Stefan says he’s decided not to sell it. 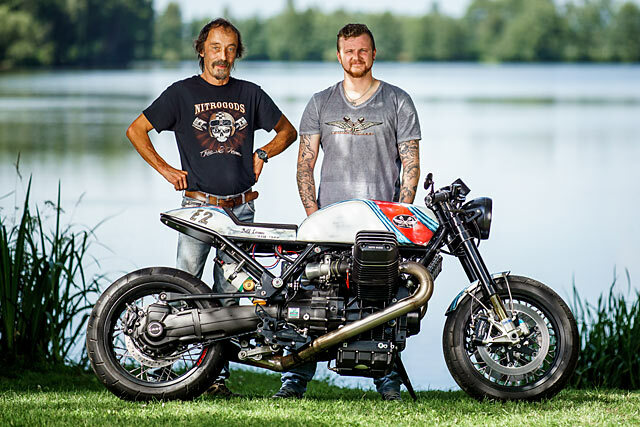 “I love this Guzzi so much, It will be my personal bike after the competition,” he smiles. 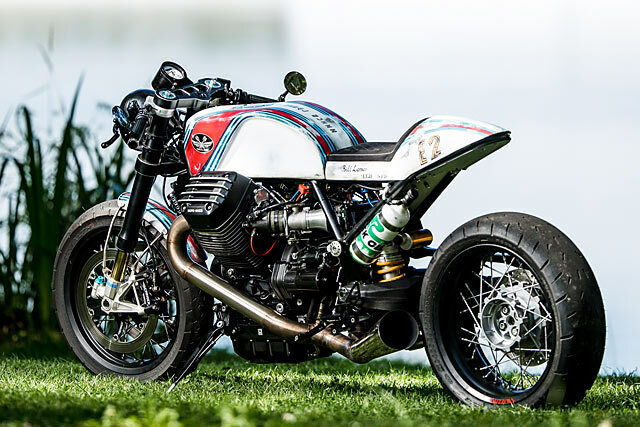 If you’re of a like mind, you can actually vote online for the bike in the Essenza competition here. Win one for Bill, boys.